Now, I’m not the kind of person to get into heated discussions in a forum (and I actually think that that kind of thinking is out-dated and somewhat comical) so I stayed out of it. But the idea did stick with me … and if I could have a face-to-face conversation with someone like that over coffee, what would I say? Well, keep reading and you’ll find out. First of all, who really cares? Some people get so wrapped up in the process that they forget what our goal is as photographers – to create memories and make beautiful images. It doesn’t matter how perfect you photograph something in-camera, in my opinion it can always benefit from a little touch-up. And just to set the record straight: getting it right in-camera is a wonderful thing, and I highly encourage it! I want to spend as little time staring at pixels on my computer screen as possible and still get wonderful results, and when I perfect an image before it hits my computer then I shave off a lot of time to my editing. But if a photographer wants to heavily rely on Photoshop to make their images look good, then so what? I really don’t undersand why it’s such a big deal. Photography is evolving and changing, but it’s still photography if you digitally edit, enhance, crop, tint, or alter your images. I’m sure that there is a point when the image crosses the “photography” line and becomes “digital art”, but think of some of the types of photographs we can create these days that were difficult in the past. HDR would not be possible without using some sort of post-processing software … but we could always argue that it’s still something that could be carried out in a wet darkroom, tedious though it may be (as are several other methods of post-processing). I also wonder, is the overall debate an issue of new technology and younger photographers? Are these people worried that they’re going to lose their corner of the market to someone who’s owned an SLR for three months but can use a computer? As a photographer heavily involved in micro-stock I’ve seen other photographers throw a lot of hateful comments towards the industry in general, and there is only one word that I can use to describe those types of people: insecure. If you’re really afraid that your job is at risk, then adapt and overcome. The cream will always rist to the top. And in my own defense – I do know photography, and I have a pretty good understanding of light … but I still use Photoshop. And back when I was shooting film and processing images in both color and black-and-white wet darkrooms, I still had to adjust the color and tones, and even use filters to make my prints look the way I envisioned them. Oh, and I even had to push-process my film every once in a while cause T-Max didn’t go past 3200 ISO. Is all of that cheating, too? When I hear comments like I read in that forum post I always wonder if there’s more “between the lines” than what is actually said. I don’t think those people are anti-Photoshop, I think that they try to justify their insecurities and refusal to adapt by belittling photographers and artists who do use digital editing tools. But enough of all this talk – I’m gonna stop ranting and go make some more photos. Cause, as we all know, talking about photography is not doing photography. I agree, results count more than technique. Personally I can appreciate a good, no modification photo as much as a heavily modified composition, if the result appeals.. I used to print my own black and white stuff by hand, and there was a lot of “cheating” there too. If using Photoshop is bad or considered cheating, then what would happen to fashion photography? Or food photography? What Photoshop has done is open up a new creative zone for photographers, especially those “old school” photographers who spent more time in the darkroom than actually shooting. A good photograph begins in the camera and what is done after that is up to the person who shot it. In photography (and every form of art) there will always be someone that has a problem with the way it’s done because to them, any tool that someone else uses that THEY choose not to use, is “cheating”. Good post! I love Photoshop, and I also care deeply about getting a good shot to begin with (in the traditional photography sense with proper exposure and good composition). I usually use Photoshop for minor tweaks if the shot isn’t quite there, or if I want to make some abstract or more extreme effects. I learned how to develop film in the darkroom a few years ago, and I don’t see PS as all that different than using filters or dodging and burning. It all does the same thing right – it enhances a desired effect? Also I’d bet a lot of those old school pros and purists have elaborate lighting set-ups and equipment that a lot of us amateurs and photo newbies don’t have access to. PS lets us fix some common errors that we might have avoided if we’d had the ideal lighting setup. Photoshop is a great but complicated tool, and effective use requires a lot of skill. I think some people are afraid of it, or have the perception that it’s easy to fix major photo problems with it. I blame ignorance. I, being a rank amateur, have an opinion on this. Photoshop like a digital camera is a tool. There are people that can use the tools correctly to make amazing creations (like Nicole). There are others that take the same tools and make an electronic pile-o-crap. It is not a matter of the number of layers, the brushes used, the different effects, or even the camera used. It is, and always will be, about the skill of the artist employing all the tools they have to make great pieces. I imagine that when Monet started painting there where those that sat back and complained that he was “over-colouring” his pictures. Masters/innovators are never doing it “right”. I have said it once, and I will say it many, many more times. I love your work, both the images and the instructions. You have a great ability to capture life as it should be, and communicate how I can do the same better. Thank you for everything you do. In a perfect world, everyone would be able to capture the shot in camera the same way that they envision it. We don’t live in a perfect world. If ti wasn’t for Photoshop (and programs like it) the beauty portrait photographer would have a lot of unhappy clients. They can photograph to most stunning model, have perfect lighting, the perfect setup, but there will always be that little “imperfection” that needs to be cloned away. It wouldn’t look good to have a model advertising skin cream and have a few blemishes. With cameras coming with higher and higher resolutions, these minor things stand out even more. Digital cameras don’t always capture colors the way you remember seeing them while you were shooting either. The bottom line is, it’s the end result that matters, not the process. Would you dine at a 5 star restaurant and complain that the chef used one cooking style over another if the food looked and tasted excellent? We had the same heated discussion last year in the Ogden Camera Club. This club has existed in Northern Utah for more than 50 years. Using a computer to tweak an image beyond cropping and basic color correction was strictly prohibited. We had photographers that were interested in joining the club, but when they saw the rules regarding photo manipulation, we never saw them again. My position has been: Even Ansel Adams manipulated photos with his dodge and burning techniques. And whether you like it or not, your digital camera has manipulated your image before it’s ever written to the memory card. Like others have stated above, it’s a tool and just like any tool to a craftsman/woman or artist, it’s all about subjectivity and personal preference. The Ogden Camera Club changed photo competition rules last year. Since then we’ve had some amazing images. And when someone like me pushes the envelope with HDR, the judges react with their own subjectivity. And as a photographer, I’m willing to defend the tools I use to create the image that I envisioned. Photoshop if funa and 33% of the process for me. 33% is the fun of taking the image. 33% is the fun of finding the image to take. 1% is backing the photos up…. I ramble through Photoshop like I through photography in general (and blog posts it seems). It’s all good, and if you don’t think so… that’s fine too. There’s nothing wrong with using photoshop to fix an image, but once that image becomes distorted to the point that it does look digital and you can tell they did some heavy “painting” or brushing then I’d say that’s their call. It’s not anyone else’s place to judge someone’s work based on the fact that they use photoshop. And I agree, they might as well as jump in with the rest of the people, go with it and be the “cream”. Did Ansel Adams use photoshop? No, he didn’t have that tool, but he used the darkroom to make his photos look the way he wanted after he shot them. In fact he often took photos with the darkroom in mind. Using Photoshop or Lightroom or a Darkroom, is part of the photo-creative process. What is a purist? It is someone who’s insecurity makes them bark like a mad dog at others who are having success doing something/anything different than themselves. Would Andrew Wythe be justified in saying that Jackson Pollack was not an artist because his art looked different and was created differently? Purist Smurist. I don’t believe in them anyway. I’m not one for confrontation, so I never share my opinion, but honestly, there are people who would pick a fight no matter what, and there are people who respect others’ opinions. If I keep my thoughts to myself, then their opinions become the truth, rather than just a conversation. I really think the issue is they feel threatened, and they really don’t need to (unless they refuse to continue to learn-all professions evolve). I guess it is because there isn’t a license to “prove” you are a photographer, it is something anyone can try, it is subject to taste and opinion-but that is art! Should we really be threatened when someone creates something that means something to them, even though it doesn’t follow the rules (or even if we think it is crap)? I think people that have these views are putting creativity and art at risk, not photography. I taught third grade for 4 years and it was scary how children are not allowed to express themselves and experiment as much as they should. That is how they learn! There is so much research now about spelling for instance, and how they learn to spell correctly by making mistakes. Children who have memorized multiplication do not really understand it. They have to experiment, manipulate, and figure it out. Give people a chance to learn photography! Don’t insist on perfection-it only backfires. I’ve seen it countless times with my students, as soon as they worry that it isn’t correct, it only perpetuates their stagnation, and THAT risks the business of photography. They must just be scared of competition. But everyone has something to offer the world of photography. If a client chooses someone else, that is a reflection of THEM, not YOU! People new to photography will either figure it out, or won’t succeed in the business. And if they succeed taking family pictures and their clients are happy, who cares? Just because I go to McDonald’s doesn’t mean I think they are professional chefs. It doesn’t mean I don’t know that there is better food out there if I could afford it. Pros wouldn’t care if they didn’t get that business anyway. I have some pictures up in my house that aren’t perfectly exposed-but I don’t care because the pictures have meaning to me. I don’t think the teaching profession is at risk because teachers start teaching before they’ve had a lot of experience-that is how they learn to teach! And experienced teachers are not great teachers unless they continue to learn and evolve with the profession. The photography issue is just more obvious in the world of photography because of the internet and blogging. Photographers should know the technical aspects of photography, and how to get a great image out of camera. If they don’t, they will learn, or won’t be successful in the long run. I’m figuring that out really quickly. You have to know the rules to break them! Don’t be threatened by others learning photography-if they ignore the fact that there are pros out there that can teach them, that’s their problem. I know I won’t reach my potential without being open to constructive criticism from pros, whether I like their style or not. I think the world should be thankful that people find joy in expressing themselves and being creative, whether they are going to be a famous photographer or not. The people who are just getting into it because everyone else is won’t have the drive to continue, but they will have experienced an art form in their own way. Creativity is defined by the PERSON. What is creative to one person is un-original to another. I am so tired of arts being cut in education because they think it isn’t as important as being taught the “right way” to learn language arts and math. Curriculum is defined, and creativity is squelched because of the need to make sure they can answer a test question. We aren’t teaching children how to survive in the real world! Some will make it, but those children who don’t learn the “right answer” because they don’t learn figure out the solution in the same way as the teacher/”pro”-those are the ones who will be left behind! Children and adults are born with a need to be creative! There is no such thing as someone who isn’t creative-we all create. If photoshop is a crutch, I think it is pretty obvious. 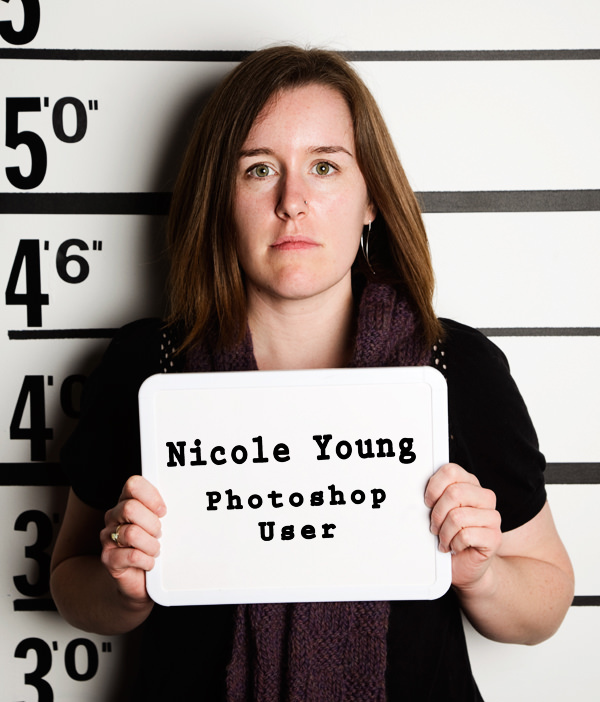 Nicole is making money because she knows photography, not because she knows photoshop. I don’t have a photography degree. I make mistakes. I will make mistakes. For a long time, I wouldn’t post my work because I knew a pro could look at it and pick it apart. I don’t care anymore. If you want to give me advice, PLEASE DO! I am the first to admit that others have more experience than me and I WANT to learn from the pros. Just don’t jump to conclusions that I think I’m a pro and I’m done learning. And don’t assume that by blasting my work, you are making me curl up in tiny ball and think “okay, I’ll quit.” I was accused of being a “camera-user,” not a photographer. If not doing things the way you did them makes me “not a photographer,” then I don’t want to be a photographer. I am an artist. I create. That is how I learn. And that is how my business is going to be a success. I may still get criticism, but my success is not measured by others’ work. My success is measured by MY progress. Just like in education, children aren’t successful by comparing themselves to others. It inhibits their ability to grow. As children grow up, they lose the privilege and permission to create. PLEASE don’t squelch someone’s innate desire to be creative. Just re-read my comment-I was only speaking so passionately to convince myself of what I was saying, or I’d be too scared to comment as the “not-pro-yet.” I think our opinions are under-represented and under-valued, for obvious reasons. I wrote my comment simply to put an opinion out there that I haven’t heard yet, not to imply that I know all or that my opinion is right. As long as it’s not photojournalism, which should never be photoshopped other than simple color, exposure, noise and white balance settings, then there’s no problem with doing as much post processing as you want in my opinion. For creative, fashion, portraiture and other forms of photography it’s all up to what that person is going for. I rarely use Photoshop anymore but it’s not for lack of know how. I’m just striving to take my shots well with the camera and Lightroom is usually all the adjusting I end up needing. My one problem with photoshop is when people try and present something heavily edited as “untouched”. Fortunately, most of us know better these days and can spot that type of behavior. I just read Scott Bourne’s Photofocus posts from today and yesterday and had to make one more comment…I did not mean to imply that professionals can’t instruct people like me (who really are striving to become pros) on how to keep dignity in the profession. I learned from Scott’s post that there is a “so what” to what some photographers are doing. Gave me some great things to think about, and I promise I’ll save them for my own blog now, Nicole. ;) I always appreciate Scott’s posts because he really does have the profession and the photographer in mind. It annoys me that people feel like they can and tell people how to create their art. It’s never right and it should never be right. Wow Niki, well said. The entire time I was reading this, Martha’s name was running through my mind. It must be hard for some to let go of their way of doing things.